With the release of his fourth album Pictures of Us, BRADEN GATES has proven himself to be deserving of a wider audience and worthy of the attention he's received in five short years as a performer. Writing layered songs that bounce from those that brim with emotional depth and stark imagery to those that find the humour in life, Gates has quickly created a body of work that is impressive for its sheer volume. More importantly, his growing audience is moved by the poignancy and the poetic turns that bind his material. The touchstones of his talents are many and his influences run from traditional roots music to contemporary singer-songwriters, many of whom he continues to study. Gates is no hummer and strummer as his guitar playing can earn him as much praise on a given night as the songs that his playing cradles. His foundation came from his father's love for, and talent as an old-time fiddler. Music is in Gates' DNA and his early memories of being moved by music are the strong melodies which he would fall asleep to, sometimes as a child nestled side stage or in the kitchen of a funky prairie community hall. Fast forward to his late teens and Gates was impressing audiences with his songs plus a stage demeanour that hangs on a quick wit and a sly grin. In short order Gates was playing roots music haunts like The Blue Chair and the Uptown Folk Club in Edmonton while accepting sought after gigs at regional festivals like Pembina River Nights and the Beaumont Blues Festival. He was invited to play the prestigious Edmonton Folk and Vancouver Island Music Festivals before hitting his 22nd birthday. Gates has benefitted in his musical education from mentors such as Miles Wilkinson, who produced some of Guy Clark's best work (Boats to Build & Dublin Blues.) Wilkinson, who has worked closely with Gates on previous studio outings, says, "that his obvious writing and performing talents, stand beside his understanding of roots, in older acoustic music. That's a rare thing for a young musician. His heroes are Clark, John Hartford, and Townes Van Zandt, all great singing story tellers. And I feel Braden is destined to join them." High praise indeed. 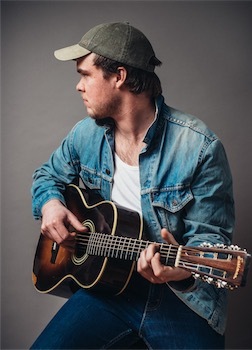 With talent and dedication to his craft, it is no surprise that Gates was nominated for the 2017 'Emerging Artist of the Year' and 'Contemporary Album of the Year' at the Canadian Folk Music Awards – his showcase performance at that event created buzz. With a new album set for release in 2018 on Canada's premier folk / roots label Borealis Records, this inspired singer-songwriter is destined to win over new audiences at every opportunity.